The truth of the matter is that books like The Devil in Montmartre used to be my go-to favorites for a very long time -- historical crime fiction, set in a specific time period in a specific place. I read so many novels in that subgenre that I burned myself out after a while and had to move on to something else entirely -- in fact, I can't even remember the last time that I made an active decision to read a period crime novel. Now after reading this one, I remember why I used to enjoy them so much. Plus, any book with Toulouse-Lautrec as a character definitely has my vote. Even though it's very much lighter than my normal fare, it's still quite good. The year is 1889, and it's only two weeks before the closing ceremonies of that year's Expedition Universelle. A year earlier, London had been in the grip of fear because of the horrific acts perpetrated by Jack the Ripper. So when a female torso is discovered in a city sewer, the police want to catch the murderer as quickly as possible to stifle any rumors that the Ripper has crossed the channel and set up shop in Paris. The chief inspector of the Sûreté, Paul Feraud, knows that he needs his best man for the job -- and that just happens to be Inspector Achille Lefebvre. Only thirty, Lefebvre is "a new breed of detective," one who believes wholeheartedly in applying modern investigative techniques in his work. And he's going to have his work cut out for him. But he gets lucky: the autopsy report reveals a startling clue that points Lefebvre in a particular direction even though someone is doing his level best to put the frame on someone else, and the report of a missing woman gives him a potential lead on who the victim might be. He has to work quickly, though -- while he's working hard to make sure he gets everything right, his rival in the police department has his own ideas about how to bring a quick end to the case, one that could definitely incite mob violence in a city where the divisions caused by the Dreyfus affair are still fresh and are still on everyone's mind. The Devil in Montmartre is set in the Paris of Henri Toulouse-Lautrec, where the whirling skirts of can-can dancers mesmerize the customers of the Moulin Rouge, where the small boîtes serve as meeting places for professionals and street people alike, a place where art and artists flourish. The author easily captures this atmosphere and the beautiful parks with their gardens visited by tourists from America and England; in contrast to the beauty and excitement of the city, he also takes his readers into dirty back streets and alleys and out into areas controlled by the city's criminals, places that most visitors to the city never see. It's also very obvious that the author put in a LOT of time on research, especially in the area of police work and contemporary investigative methods. Putting that together with his character construction, it's impossible to believe that this is his first mystery novel. And anyone who's ever read what I write here knows that I'm not averse to saying exactly what I think, so that's high praise. Trust me -- I've read enough first novels to feel qualified to judge. On the other hand, and this is probably more on my end rather than his since it isn't all that obvious, I figured out the who quite early into the story. I wasn't overly keen on the romantic parts either, but that's a personal thing and an area where I tend to find myself in the minority. However, I will say that the book made for fun reading. 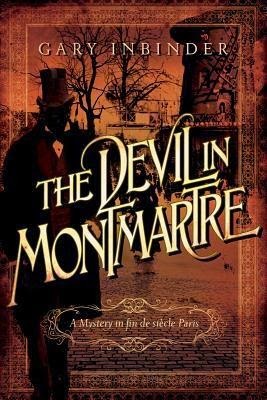 Hopefully there will be a sequel some day, but in the meantime, The Devil in Montmartre should especially appeal to fans of historical crime fiction or historical fiction in general. It's lighter than my normal crime preferences, but there is definitely a good central mystery to be solved, and even though a headless torso may make some people maybe want to think twice about picking up the book, the violence is not anywhere near graphic nor is it overused or used gratuitously in any way. That in itself is commendable these days. I think Mr. Inbinder has done a fine job here with his first book. I hope it's the first of many.